Forget Gold: New Recession-Proof Commodity is . . .
Hershey Co.’s fourth-quarter profit and sales growth suggests that demand for chocolate remains strong despite the dismal economy. The sweeter results also suggest a welcome shift for the Pennsylvania chocolate maker as Valentine’s Day nears: a slowdown in sales of pricier “premium” chocolates. Hershey had lagged competitors in jumping on the premium bandwagon, and just a year ago was struggling to keep pace with rival Mars Inc. . . . But, as with coffee, eating out, and apparel, the recession has consumers trading down with chocolate. . . .
Swiss chocolate maker Lindt & Sprungli AG, maker of premium Lindt chocolates, reported a 5.8% sales increase in 2008, saying that was at the low end of its long-term goal of 6% to 8% annual sales growth. “Considering the market conditions, this result is encouraging,” the company said last week in a news release. Hershey’s [CEO David] West said consumers already have been trading down to his company’s lower-priced Reese’s Peanut Butter Cups, Hershey’s chocolate bars and Kit Kat wafers. Hershey also has noticed an increase in sales at discount retailers and convenience stores as gasoline prices have fallen. Hershey reported fourth-quarter net income of $82.2 million, or 36 cents a share, up 51% from $54.3 million, or 24 cents a share, a year earlier. Excluding restructuring charges and write-downs of 23 cents a share in the latest period, operating income climbed to 59 cents a share from 54 cents a share. Revenue increased 3% to $1.38 billion. Sales gains from Hershey bars and other core products were partially offset by a decline in sales of Hershey’s Kisses. Mr. West said the brand suffered from an abundance of Kisses varieties, and the company is now paring the number of products and running new ads. 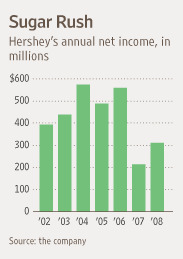 Some analysts remained skeptical of Hershey’s future, though. Stifel Nicolaus analyst Chris Growe said in a note to clients, “Although the quarter showed some signs of modest improvement and the stock very well could trade higher in the short run due to the [earnings] upside, the premium valuation that the company maintains is undeserved in our view and we maintain our sell rating.” . . .
Hershey said it expects sales growth of 2% to 3% in 2009 and repeated its earlier forecast that earnings per share in 2009 will be lower than its long-term goal of 6% to 8%. Shares of Hershey stock rose 6.8% or $2.38 to $37.48 in 4 p.m. New York Stock Exchange composite trading. It’s interesting that Hershey is doing so well, since as far as cholocates go, it’s not at the superior end of the market . . . even if people are trading down. Yes, it’s relatively inexpensive, and that’s part of the appeal. But I never sacrifice when it comes to the occasional purchase of chocolate. The price difference is so small in terms of other areas to cut expenses. Although I like Hershey’s milk chocolate, I acquired a taste for the healthier bittersweet chocolate from my father. Our favorite brand: Lindt (also doing well, as noted above). Since all chocolate is calorie-rich, a little bit of bittersweet chocolate goes a long way–you crave it less. Still, I’m happy for Hershey. Glad to hear at least one American company is doing well in this economically depressed time. I hope the food police don’t take this too hard. 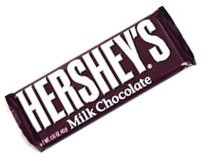 On the other hand, as I noted a couple of year’s ago, Hershey Es La Grande Mexicano Chocolate Bar, moving chocolate plants to Mexico away from America . . .another reason it’s doing well and not good for us. People are turning to cheap food in these bad economic times: Spam, Hershey bars, and the dollar menu of any fast food joint. I personally prefer to shop at the local thrift store for pre-chewed food items. Fortunately, I find all what I want there, with half price compared to the Dollar Store. Stick with Hershey’s! Do NOT go near Nestle. Nestle is Swiss. Debbie, over the years I’ve been told that Hershey’s is crap, it’s barely chocolate, etc. But I’ll take a Reeses PB cup, a plain Hersheys chocolate bar or even cherry Twizzlers on a deserted island b4 any of the chichi candy brands I’m supposed to prefer. I like peanut M&M’s too, in case you’re writing this down. Hersheys no longer manufactures anything at all in the United States. Hershey’s chocolate bars are made in Mexico, and they are building new facilities in the People’s Republic of China. Hersheys is a true multi-national with allegiances to no people or nation, certainly not to America or Americans. I choose to avoid the risks of salmonella and melamine poisoning. I will give this to the kids. They have a competitive Stock Market Club at school and this will be a good product that they can easily understand and enjoy “purchasing” for their team. Want some awesome American-made bittersweet chocolate? Try Ghirardelli, they’re from California.